In every drop of seawater is a teeming world of microscopic organisms including bacteria, zooplankton, and phytoplankton. The phytoplankton, or algae, are the “grasses of the sea”, turning inorganic nutrients and carbon dioxide into organic material and oxygen. The vast majority of phytoplankton are beneficial; however, a small fraction of them can cause problems by producing toxins, discoloring the water (“red tides”), causing blooms that result in anoxia and hypoxia when the bloom decays, or impacting marine life through direct contact (think of “swimmers itch”, an allergic reaction to the compounds made by phytoplankton and bacteria). Those phytoplankton that are detrimental to human or wildlife are collectively called harmful algae or harmful algal blooms (HABs). Within this larger group we can divide the organisms into types. The majority of HABs are dinoflagellates, including Alexandrium, (produces Paralytic Shellfish Poisoning), Dinophysis (produces Diarrheic Shellfish Poisoning) and Cochlodinium (causes fish kills). In California, one of the best-known HABs is a diatom, Pseudo-nitzschia (causes Amnesic Shellfish Poisoning). This diatom is responsible for the nearly annual occurrences of pelican, sea lion, dolphin, and otter mortality . Think of the near shore ocean as a giant living soup, full of organisms. These range in size from large (fish, birds, marine mammals), to small (crustaceans, bivalves, seaweed), to tiny (krill, diatoms and dinoflagellates, bacteria, viruses). All these organisms are part of the food chain and tend to remain in fairly balanced proportions. Sometimes, however, the balance is disturbed: conditions become ideal for a particular group (due to, for example, nutrient inputs) such that one organism greatly increases in mass and many of the others die or become scarce. 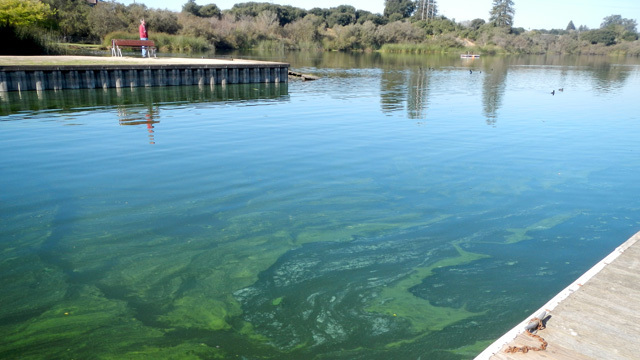 This leads to a bloom, and with apparently increasing frequency in coastal California, to harmful algal blooms . While these organisms (including the HABs) have been here for millions of years, we know that some human-induced changes can make things worse. For example, Pseudo-nitzschia responds strongly to urea, a form of nitrogen. When given urea toxin production can double, leading to more problems. While urea is naturally produced by mammals, the vast majority of it entering the coastal ocean is from humans, due to (for example) leaky septic tanks, fertilizer runoff from lawns and gardens, and many “harmless” chemicals such as cosmetics, toothpaste, and airplane de-icing liquid [3, 4]. We are also seeing new and unanticipated problems. A previously “harmless” dinoflagellate was implicated in massive bird kills in 2007 and 2009 on the west coast, caused not by a toxin but by production of a foam that stripped the water proofing from bird feathers, causing the birds to die from hypothermia . Another phytoplankton that grows in freshwater systems, blue-green algae or cyanobacteria (if you’ve seen “pond scum” you’ve probably seen blue-green algae) produces a deadly toxin called microcystin. These toxins are washing into Monterey Bay and caused the death of at least 21 otters between 2007-2010. Blooms of cyanobacteria in the coastal watershed have been linked to nutrient pollution and an increasingly warm environment, again pointing to human activity . Freshwater and marine HAB events are an escalating problem in coastal regions world-wide, resulting in significant economic losses for commercial fisheries and negative health impacts on marine wildlife and occasionally, humans. The diverse HAB events provide several examples of the link between HABs and coastal pollution, and suggest that our coastal marine ecosystems are becoming progressively impacted as a result of human activity. Understanding the underlying causes of marine mammal mortality events can help stimulate mitigation of coastal pollution by nutrients and other possible drivers of HAB events, and great progress is being made in understanding the causes of HABs and predicting the locations and impacts of these imbalances in the ecosystem. While HABs will never “go away”, we are closer than ever to understanding when, why, and how they impact our coastal seas, which will ultimately lead to a healthier and safer coastal ocean. Kudela, R., G. Pitcher, T. Probyn, F. Figueiras, T. Moita, and V. Trainer (2005), Harmful algal blooms in coastal upwelling systems, Oceanography, 18(2), 184-197. Miller, M. A., R. M. Kudela, and D. A. Jessup (2012), When marine ecosystem fall ill, The Wildlife Professional, Spring 2012, 44-48. Kudela, R., J. Lane, and W. Cochlan (2008), The potential role of anthropogenically derived nitrogen in the growth of harmful algae in California, USA, Harmful Algae, 8, 103-110. Anderson, D., et al. (2008), Harmful algal blooms and eutrophication: Examples and linkages from selected coastal regions of the United States, Harmful Algae, 8, 39-53. Jessup, D. A., M. A. Miller, J. P. Ryan, H. M. Nevins, H. A. Kerkering, A. Mekebri, D. B. Crane, T. A. Johnson, and R. M. Kudela (2009), Mass stranding of marine birds caused by a surfactant-producing red tide, PLoS ONE, 4(2), e4550. Miller, M. A., et al. (2010), Evidence for a novel marine harmful algal bloom: Cyanotoxin (microcystin) transfer from land to sea otters, PLoS ONE, 5(9), e12576.